James Sadler (February 1753 – 28 March 1828), was the first English balloonist and the second person, after Vincenzo Lunardi, to make a balloon ascent in England. He became a Brother of the Charterhouse in 1828, having been nominated for the position by Robert Peel, who at the time was Home Secretary. Although one of the most famous men in England in his own time, Sadler is nowadays something of an obscure figure, a fact sometimes attributed to his never having produced a written work and, in part, to prejudice regarding his humble origins. He was born in Oxford, the son of James Sadler (1718–1791), cook and confectioner and his wife, Elizabeth (1718–1802). He was never a wealthy man, and owing to his lack of a formal education his innovations in ballooning and science were largely ignored by academics. In spite of this, he was popular among the general public, and was also known to consort with nobility, admirals and Cabinet ministers at a time when social mobility was unknown. 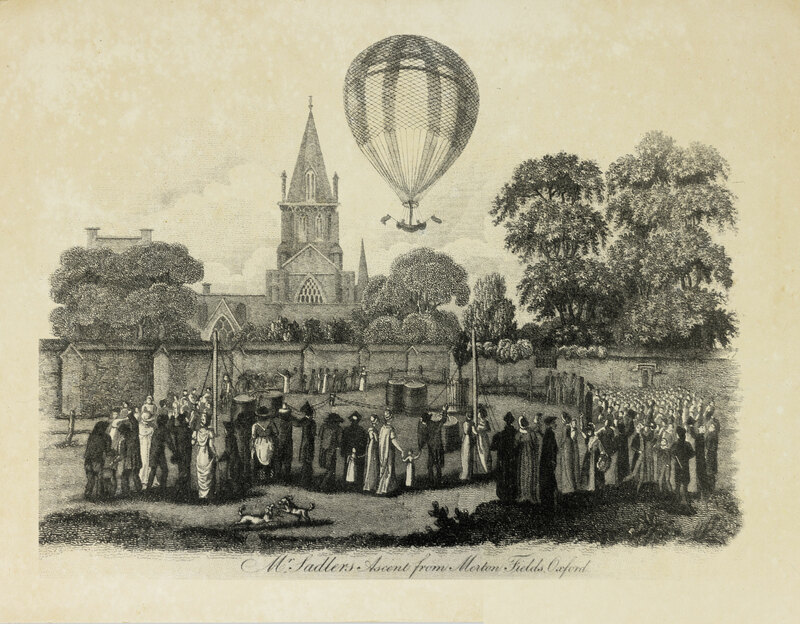 His first and perhaps most historic ascent in a hot air balloon took place at Christ Church Meadow, Oxford, on 4 October 1784. The balloon rose to about 3,600 feet and landed near Woodeaton, about six miles away. He made many further ascents, not all of which were successful. Indeed, on one occasion, he sustained bad injuries after being dragged for around 2 miles by the balloon, which eventually threw him clear before taking off again empty; on another, he nearly drowned attempting to cross the Irish Sea. In addition to being a pioneering aeronaut and daredevil, he was an eminent scientist and made a number of important discoveries, notably that hot air, rather than smoke, as the Montgolfiers had wrongly concluded, was required for airborne propulsion. He managed, furthermore, to manufacture hydrogen at a time when the element was so new it hadn’t even been named hydrogen, and was the first to create an adjustable fire in the basket to manipulate the balloon’s altitude. These innovations, though impressive, never made him rich. He became a Brother of the Charterhouse in 1828, but returned to his beloved Oxford later that same year. At the time of his death he was known to be living on George Lane (now George Street), not far from premises occupied by his relations. You can read more about Sadler’s incredible life here.